April is here and the Uxbridge Music Hall and just around the corner is a Roman classic... sort-of. 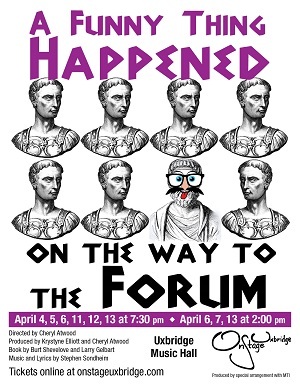 OnStage Uxbridge presents: A Funny Thing Happened On The Way To The Forum. Inspired by the farces of the ancient Roman playwright Plautus (251–183 BC), specifically Pseudolus, Miles Gloriosus, and Mostellaria, the musical tells the bawdy story of a slave named Pseudolus and his attempts to win his freedom by helping his young master woo the girl next door. All tickets are: $24.00 and include all taxes, ticket fees, and Music Hall Improvement Fund. Groups rates available of parties 10 or more. Call: 1-866-808-2006 for more information. Other great shows coming to the Uxbridge Music Hall after April include uxperience: Ux-Tra Ordinary People, Newsies, Cranial Crash & Epic Party, Mamma Mia Sing-A-Long, Brass Transit, Cadence, Barefoot on the Moon, The Mystery of Edwin Drood, The Last Waltz, The 39 Steps, Mamma Mia and The Mikado Check out these great shows and others! Make it an evening with dinner and then theatre by visiting one of the many great eateries in Uxbridge including Urban Pantry, The Tin Mill, Hobby Horse Arms, The Passionate Cook's Bistro and many others. Visit www.uxbridgemusichall.com for more great shows and to purchase tickets. You can also contact us for more information. Visit our website and click Contact Us.